One of my teenage moments of doubt was occasioned by this verse. Why would God allow the slavery of the Hebrew people to go on for such a long time? He planned that? It didn’t make sense. Doesn’t this puncture the idea that God is loving and powerful and can get things done? We’re supposed to believe the story about his Really Big Stunt at the Red Sea, but God is powerless to stop four centuries of slavery? This is the conundrum: The Biblical narrative is about a god who is not in a hurry when a whole lot of pain and suffering are happening right under his nose. Now fast forward to the last few centuries before Jesus. The catastrophe for the ancient nation of Israel was the destruction of Jerusalem in 586 B.C.E. by the Babylonians; their history went downhill after that. For the most part, Palestine was under the control of a succession of empires: Persians, Greeks, Seleucids, Romans (Jewish self-rule under the Hasmonean dynasty was a brief exception). This too was inexplicable theologically for the chosen people. Something must have gone terribly wrong, and the tendency was to blame their own sin. The thundering Old Testament prophets took this approach, and the ground shook as they delivered their blistering sermons against the sins of the Israelites and their whoring after other gods. But even if they deserved the suffering, it was just impossible to imagine that God would abandon them forever; there had to be a solution to their dismal history and national humiliation. The theology of denial gave birth to simplistic imaginative solutions, including the expectation of a messiah who would come to the rescue and the belief that God would step in to end history altogether. There was no evidence whatever for these ideas. They’re based on theological hunches and unwavering faith in the promises that old Yahweh had once made. The theologians weren’t daunted that there were inexplicable delays. John the Baptist, Jesus, and the apostle Paul appear to have bought into this messianic end-of-the-world delusion, and they all preached that the end was near; the kingdom of God was at hand. But John, Jesus, and Paul went to their graves without it happening. God, it turned out, was still not in a hurry. A favorite theme of Christian preachers is that, when things get bad enough, God will step in. They can’t let go of the New Testament texts that promise Jesus’ return. The Bible can’t be wrong, so God is still biding his time. But how bad do things have to get for a compassionate God to say, “enough is enough,” and usher in his kingdom on earth? “C’mon God, split those clouds and come on down so that your will can be done on Earth.” Such delay is a major contradiction for those who passionately argue that God is good and omnipotent. Human history is indeed the story of God-missing-in-action. 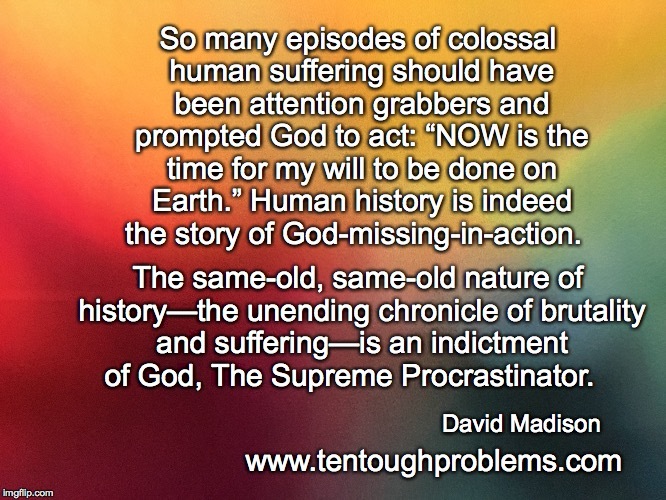 The same-old, same-old nature of history—the unending chronicle of brutality and suffering—is an indictment of God, The Supreme Procrastinator. 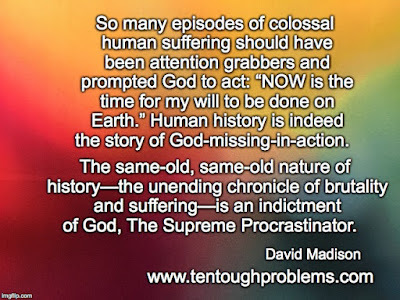 David Madison has a PhD in Biblical Studies from Boston University, and was a pastor in the United Methodist Church for nine years. His book, Ten Tough Problems in Christian Thought and Belief: a Minister-Turned-Atheist Shows Why You Should Ditch the Faith, was published by Tellectual Press in August.